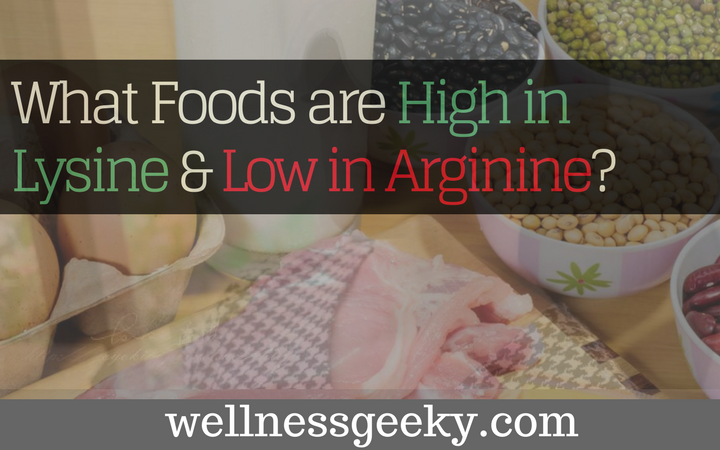 What Foods are High in Lysine & Low in Arginine? You are here: Home / Healthy Diet / Health Supplements, Vitamins & Minerals / What Foods are High in Lysine & Low in Arginine? Lysine is an essential amino acid responsible for the formation of collagen, regulation of cholesterol, growth and development, and calcium absorption. On the other hand, arginine is a conditionally essential amino acid that supports the function of the immune system, healing of wounds and secretion of hormones. Widely available in certain foods, you’ll find lysine and arginine in the same foods in varying proportions. HERE is the best source if you a vegan, and if you are not a vegan and can eat some cheese, HERE is the one I LOVE and that is really high in Lysine. Herpes simplex virus outbreaks can be prevented by consuming foods rich in lysine and low in arginine content. Natural lysine supplements are also used in addition to foods. Since arginine promotes viral replication, high lysine content counteracts its effects. Oral herpes, HSV-1, is a potentially-chronic virus that becomes dormant in your nervous system until it’s triggered to break out. Although the virus is able to hide in the nervous system, it gets to the skin during an outbreak if you experience low immunity. It takes a strong immune system and consumption of a diet rich in lysine and low in arginine to fight the virus. Although arginine has several health benefits, it replicates the herpes virus. This means herpes patients who consume this nutrient in large quantities risk a viral outbreak. However, lysine competes with arginine to inhibit herpes viral replication in your body. According to seven randomized, placebo-controlled studies carried out to assess the effectiveness of lysine in preventing the herpes virus, the nutrient can decrease or reduce outbreaks (6 studies) and reduce outbreak severity (2 studies). The studies found that low arginine and high lysine proportions in food can suppress the outbreak of cold sores. Despite these study findings, you need to consume lysine rich and low-arginine foods daily to enjoy the benefits of this nutrient in preventing herpes virus outbreak. According to a certain study, herpes patients should consume at least 3,000mg of lysine on a daily basis. An average adult diet can provide you 6g to 10g of lysine daily. Furthermore, your body can make arginine, but not lysine because the latter nutrient is an essential amino acid. Therefore, you need to consume more lysine in your diet to prevent cold sores outbreaks and susceptibility. This explains the essence of a diet rich in lysine and low in arginine. For instance, the Mediterranean diet is ideal for herpes patients as it contains fruits, grains, vegetables, proteins and dairy products; all these foods are rich in lysine and low in arginine. You must also avoid foods rich in arginine and only opt for those with low content of this nutrient to keep healthy. What Foods Are Rich in Lysine? Legumes, meats, fish, poultry, dairy products and most fruits and vegetables are rich in lysine and low in arginine. I also recommend to take s L-Lysine Supplement because it might be an issue to get all the right amount just from food. Wheat/oats, carrots, spinach, bananas, eggs, corn and cocoa/chocolates contain lysine and arginine in a ratio of 1:1 hence must be consumed in moderation. Fresh vegetables with high lysine arginine ratio are rich in antioxidants to enhance your immune system and heal your skin. High lysine fruits are rich in essential micronutrients and vitamins you need to enhance how your body organs function and boost your immunity to prevent infections. Proteins such as chicken, fish, eggs and turkey boost how your body organs function, your immunity and facilitate healing. You also need certain spices to prevent viral replication, boost your immunity and eliminate the herpes virus from your system. Consider healthy spices such as cumin seeds, turmeric, cardamom, fennel, coriander, Mangosteen oil tree, etc. Diarrhea and abdominal cramps are the major side effects of consuming lysine in high dosages. Can you take too Much Lysine? Taking too much lysine can lead to the two side effects mentioned above. Large amounts of lysine can increase aminoglycoside antibiotic toxicity in your body. Consume a maximum of 10g of lysine per day. Avoid foods high in arginine such as seeds, lentils, orange juice, cucumber, nuts, protein supplements, etc. You must also avoid foods that weaken or interfere with your immune system. Hot and pungent foods such as garlic, black and red peppers, onions, tomatoes and green chillies should be consumed moderately as they can weaken your immunity. Peaches, tamarinds, honey, gingers, mints, mustard oils, plums, groundnut oil, etc should be avoided. Caffeine such as coffee, alcohol, junk food, processed foods, too much red meat, preservatives, additives and artificial sweeteners should be consumed in low amounts. They can easily increase your body’s pH level, hence triggering an outbreak. With the knowledge of foods rich in lysine (lysine foods) and low in arginine, you need to develop a high lysine diet plan accordingly. Herbs such as lemon balm, green oats, olive leaf extract, prunella vulgaris and chamomile can also help prevent or reduce herpes virus outbreaks if included in your diet. Although you can also take lysine supplement three times a day in-between meals to complement your diet, natural lysine is the best remedy against cold sores. Taking a diet rich in lysine and low arginine is the key to preventing the outbreak of cold sores. If taken properly in the right proportions, you won’t just be able to reduce or prevent virus outbreaks, but can also eliminate the virus out of your system. It’s also important to keep your lips moistened and drink a lot of water to prevent herpes virus outbreaks. Also take natural supplement (I recommend This Brand - Click Here). You can contact me to find out more about cold sores and how you can prevent an outbreak using natural ingredients.